The site of the Moor Pond Woods project appears on Sanderson’s map of Nottinghamshire, which was produced in 1835. Although cotton spinning had come to an end in 1828, we can clearly see the mills, pond and leats. Upper Pond lies to the north of Linby Lane. South of Linby Lane water flows through two leats (channels) into Moor Pond. 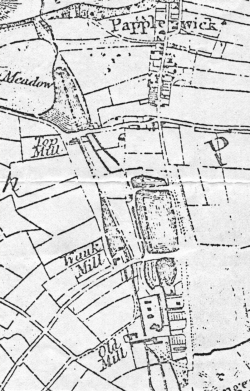 The river flows from Top Mill (now Castle Mill) to Wauk Mill (now Walk Mill) pond. Water also crossed Papplewick Lane to fill a smaller pond north of Grange Cottages, before passing southwards through another leat to the Old Mill (or Grange Mills).